Dan and Logan delaying their Zercher carry, a.k.a. resting. Post completion and load to Members area. Compare to 01/30/19. Focus: Explosive Concentric phase. Slow Eccentric phase. 1) Unilateral Arnold Press. 4 sets of 6 reps per arm. Unilateral Bent Over Lateral Raise. 4 sets of 8 reps per arm. 2) Behind the Neck Press. 6 sets of 6 reps. Increase loads ONLY if full-range-of-motion is achieved. DB alternating Front Raises. 6 sets of 6 reps per arm. Increase loads. 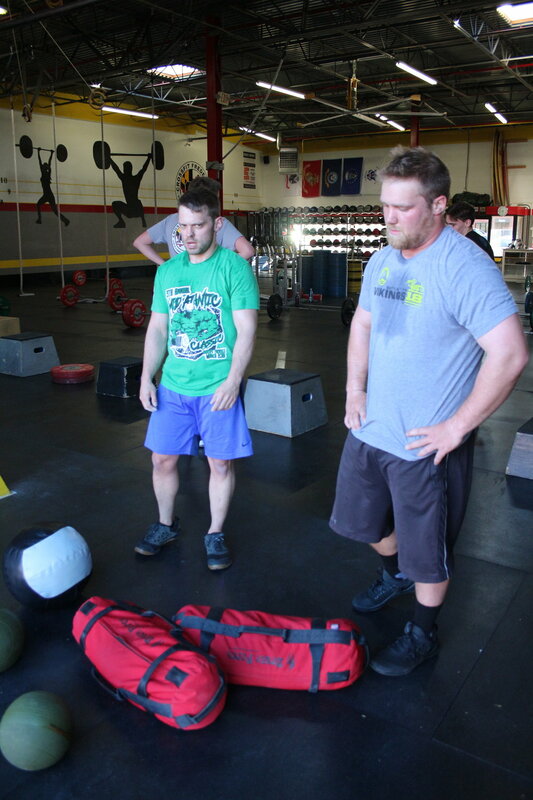 4) 40 – 10-meter Kettlebell Farmer Carries (70lbs/50lbs). Post loads to Members area.